The Youtuber Beauty Brand Collabs for 2016 You Need To Know About! 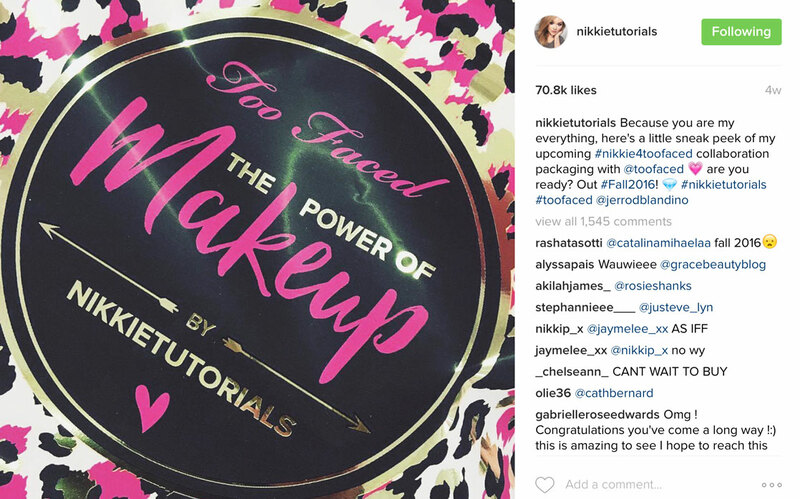 Let’s start with Nikkie Tutorials & Too Faced, as both Nikkie and the brand have now confirmed the collaboration. I’ve been scouring the interwebs for info and gossip, and all I can find is that the collaboration is described as an ‘exclusive kit’ and it will be out in the Autumn – how exciting! Nikkie has shared what looks like a close up of the packaging on her Instagram. Keep your eyes peeled on her page for more teasers and details coming up though! 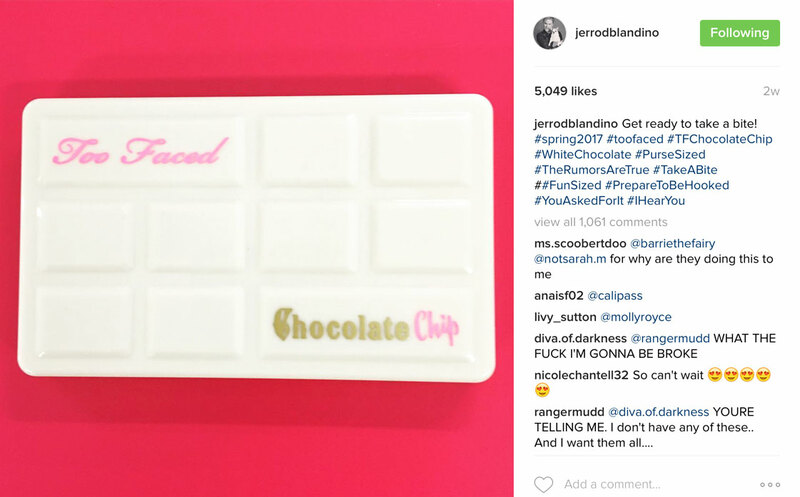 In other news, Too faced also have a load of new launches coming up – there’s the Born This Way Concealers, a limited edition ‘Totally Cute‘ palette, where you can customise the case with Too Faced stickers, as well as Japanese inspired Sketch Marker Liquid Eyeliners in a massive range of shades, Brow Quickies, Lip Injection Glossies, and also a brand new Chocolate Chip Palette coming out in Spring 2017. I can’t wait!! 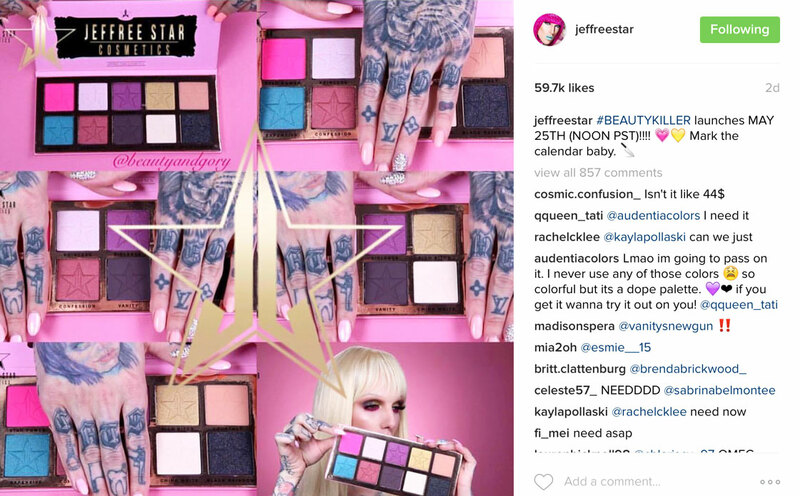 I couldn’t get through this post without including my love, Jeffree Star. Jeffree is one of my favourite Youtubers, and apart from his own amazingly successful makeup range, Jeffree has recently announced his collaboration with Morphe later this year. 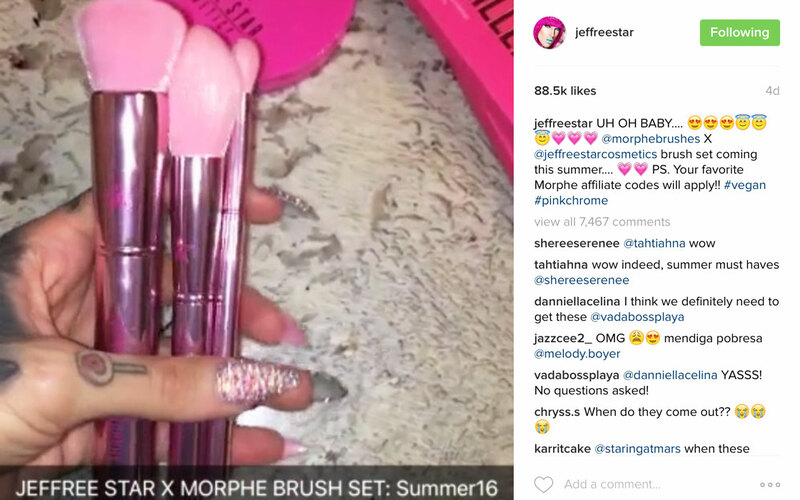 He’s bringing out a range of barbie pink metallic makeup brushes – don’t they look awesome! I also wanted to mention Jeffree’s own line, as he’s just launched some gorgeous new shades of Velour Liquid Lipsticks, in Gemini, Scropio and Breakfast at Tiffany’s. 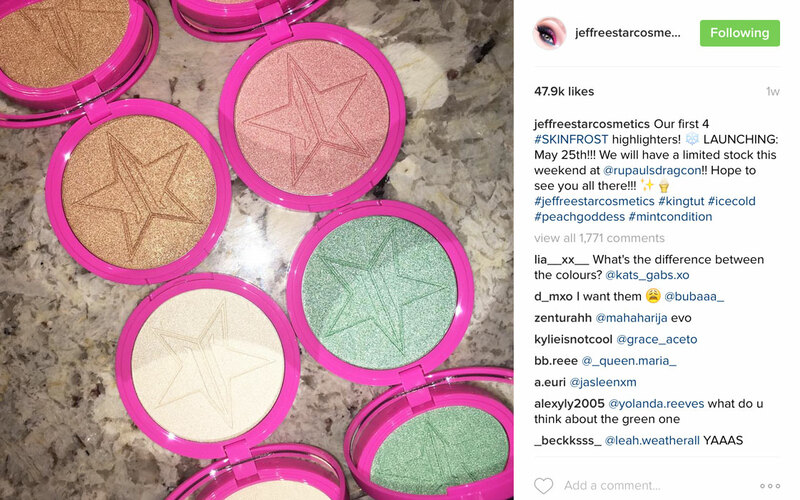 There’s also some brand new products coming out on May 25th – there will be four shades of Skinfrost Highlighters, as well as Jeffree’s very first eyeshadow palette – Beauty Killer, including ten amazing looking shades. Get this date in your diary now! 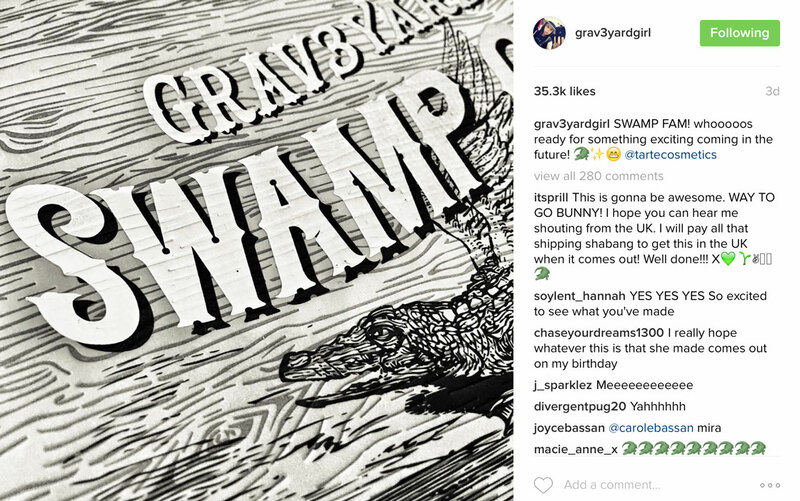 Next, the latest hot gossip from Grav3yard Girl, aka Bunny is that she’s collaborating with Tarte! 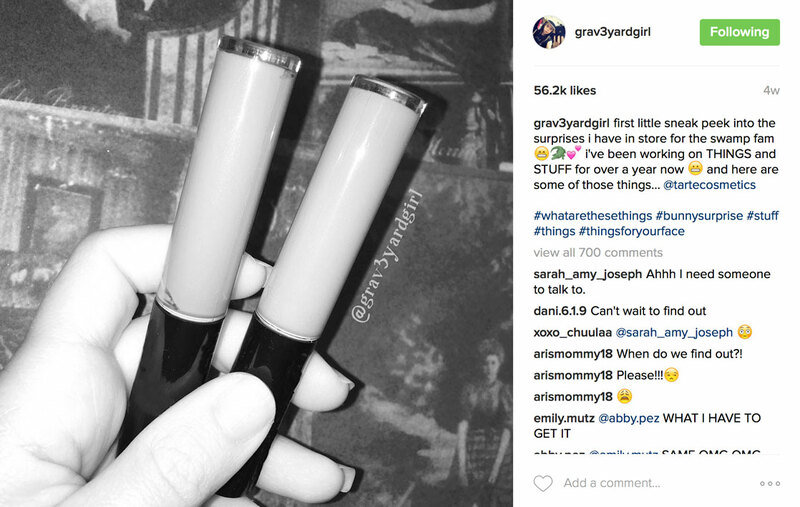 Bunny is keeping this on the down low at the moment, I can only find a picture of what is possibly some product packaging, and another of Bunny holding two products which are possibly liquid lipsticks or lip glosses. Both are in black and white so we have no idea what the shades are – I’d advise to keep an eye on Bunny’s Instagram account for more teasers and news! 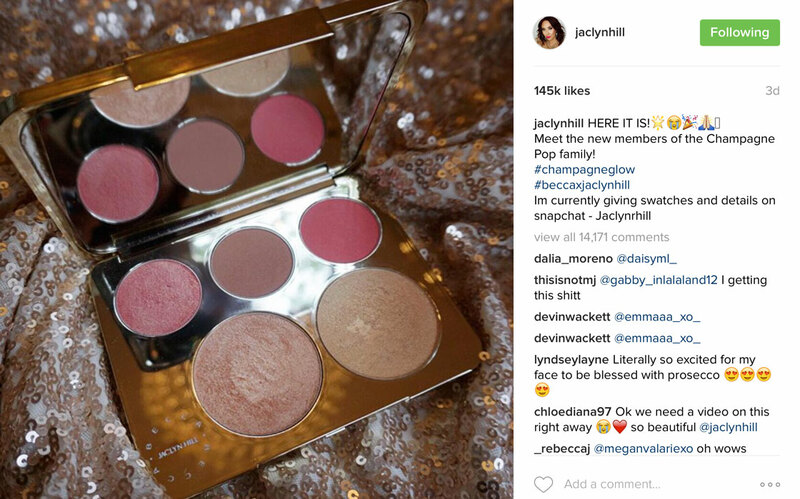 Next, after the massive success of Champagne Pop last year, Jaclyn Hill is teaming up with Becca again to launch the brand new Champagne Glow Face Palette. It includes three blushers in shimmer, matte and satin finishes, and two large golden highlighters – her original Champagne Pop, as well as a brand new shade called Prosecco Pop. This will be available at Sephora on May 26th. There are also reports, and now images coming up online of a Jaclyn X Becca eyeshadow palette too – doesn’t it look beautiful! 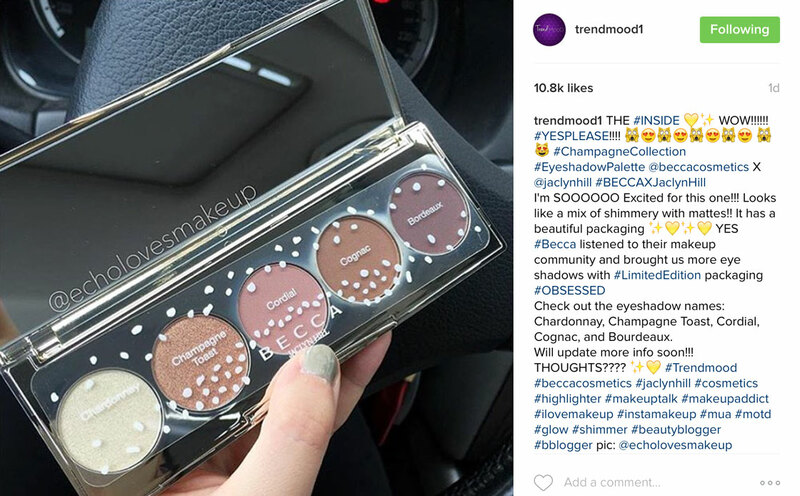 Neither Jaclyn nor Becca have confirmed it yet, but beauty goss reporter Trendmood1 has shared this on Instagram, so I’m hoping it’s the real deal as I NEED IT! And lastly, another of my favourite Youtubers, Manny MUA. Everyone and their dog went crazy for his Manny MUA X Makeup Geek palette which recently launched and sold out in seconds – I have it and it really is gorgeous! 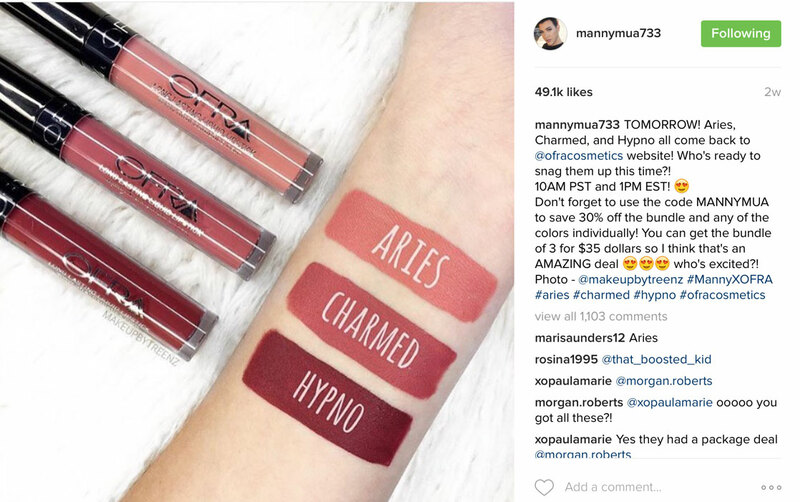 Manny has also recently launched three Liquid Lipsticks with Ofra Cosmetics too, in shades Aries, Charmed and Hypno – these are top of my wish list! So I think that’s just about it! Are you excited about any of these launches? Please also let me know in the comments if I’ve missed anything out!